Hello Pretty Providence readers! 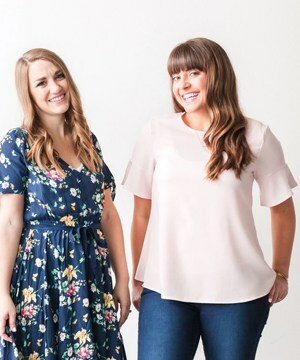 I am so excited to be a guest contributor here and have an opportunity to share with you today! I am Bethany, and I write and create at Whistle and Ivy. As I slowly recover from our recent move, I decided our home needs more color! Throw pillows are a fun, easy and inexpensive way to brighten and change the feel of a room. 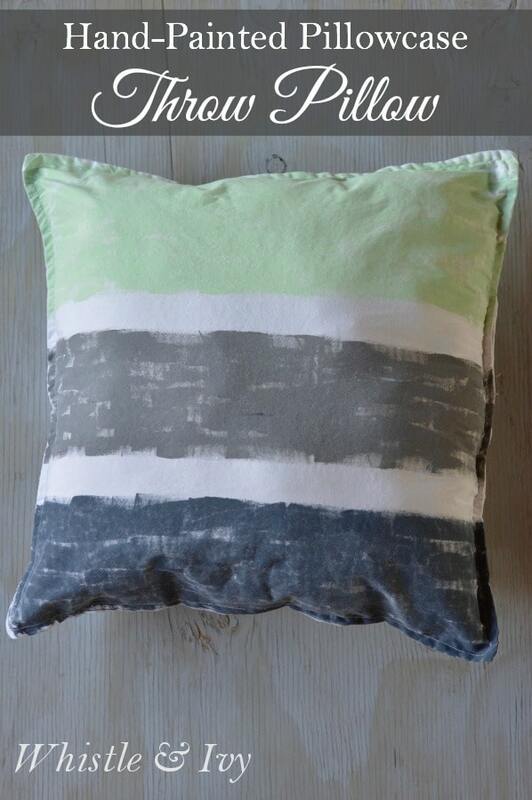 I tried to find pillows that had colors and patterns that I loved but didn’t have any luck; but since I am a bit of a DIYer, I decided to make them myself. These hand-painted throw pillows were easy to make, inexpensive (about $8 each) and completely customizable! 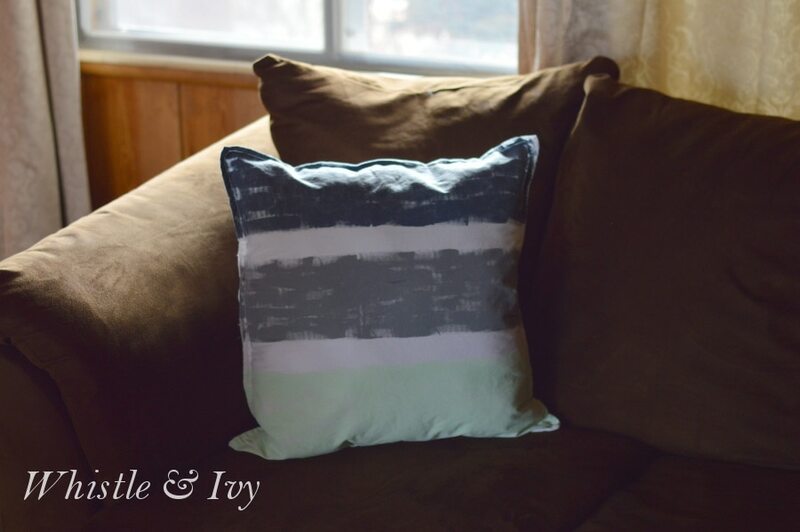 You can use either acrylic or fabric paint for these pillows. 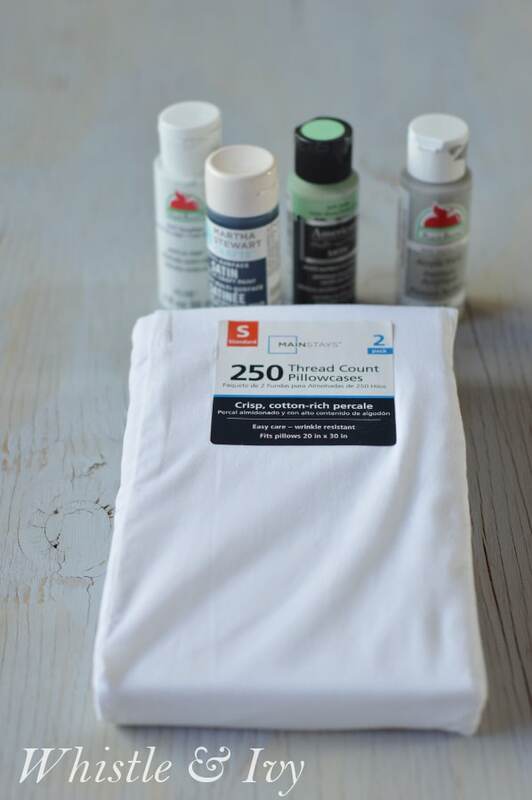 The acrylic paint will be slightly stiffer than the fabric paint, but after you wash the painted pillowcase, it becomes soft. Acrylic paint also comes in a wider range of colors than fabric paint. Be sure to wash your pillowcase before starting. 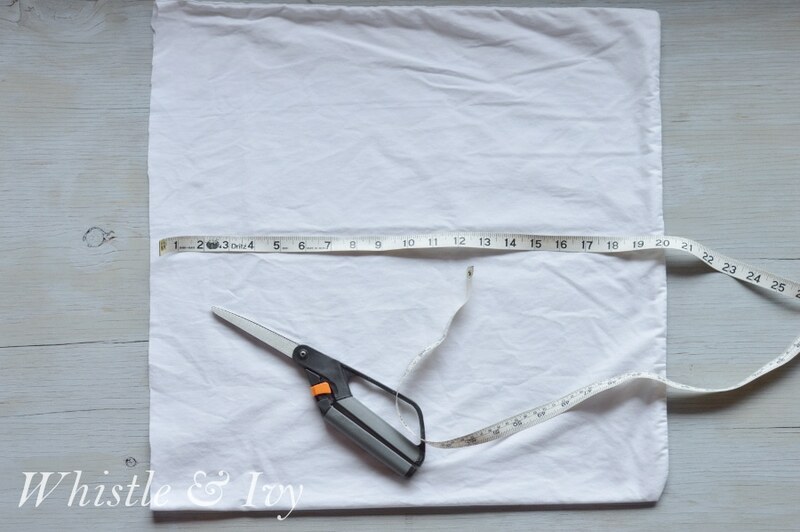 Once it’s clean and dry, start by cutting it about 20 inches wide. From here, mix your paint and start painting! Make sure to add some cardboard to keep the paint from bleeding through the other side. I was going for a rough, choppy look, so I used a small paintbrush, but if you want more of an even coat, use a larger paint brush to paint your stripes. Also, mix a little bit of water into your acrylic paint so it’s a bit thinner. 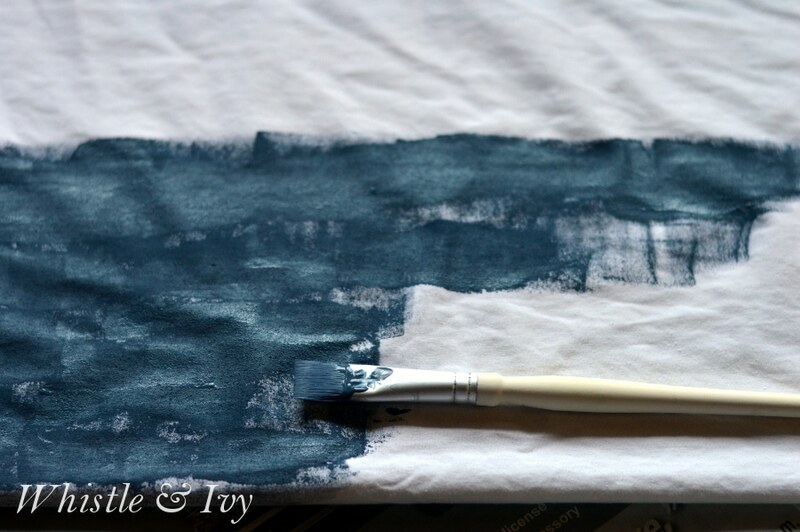 The dry cotton really drinks up the paint, so it goes on better when it’s slightly watered down. 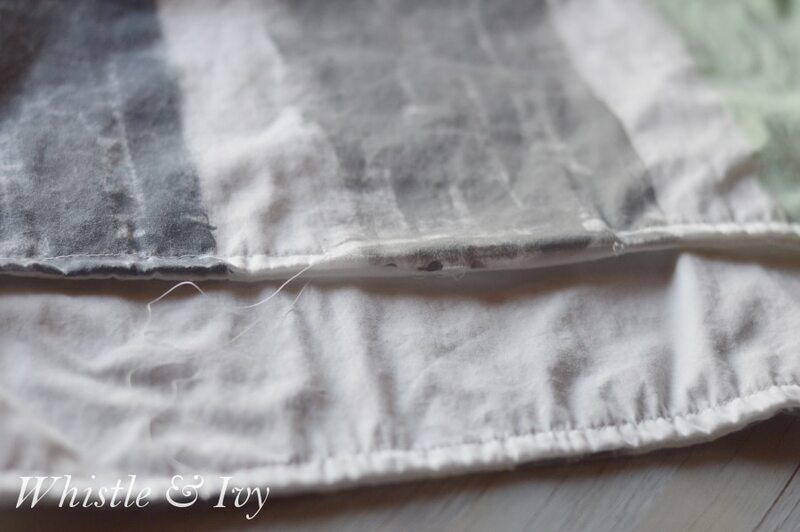 Once you are done and the paint is dry, turn it wrong-side-out and sew most of the open side shut. Make sure to leave about 4 inches unsewn (the middle of the side is the easiest place to sew it up later) for the stuffing. Keeping it wrong-side-out, iron it for a few seconds on high to seal in the paint. Then, turn it back to right-side-out and throw it in the wash and tumble dry low. 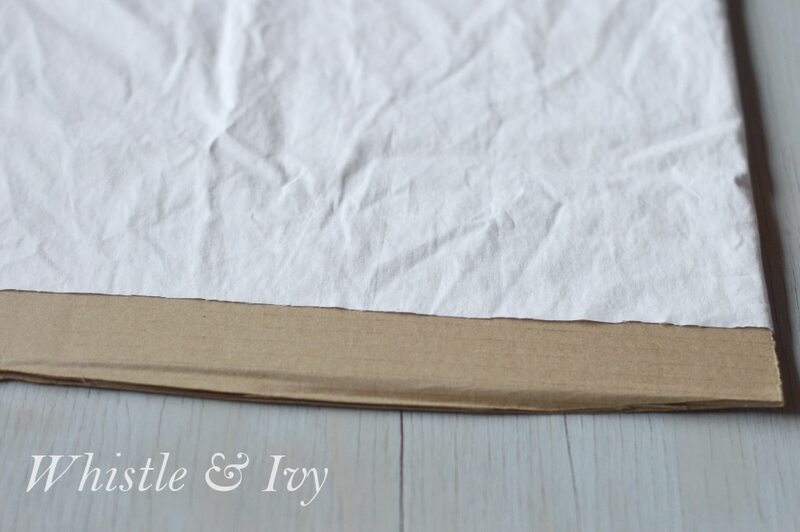 From here, keeping it right-side-out, sew around the edge of of the whole pillow except your open part. Going through your unsewn hole, fill the pillow with stuffing. I used about half the 12 oz bag for one pillow. Once it’s stuffed, pin the opening closed and sew it up. For more craft and DIY posts, subscribe to my weekly post updates here. Thanks for reading along and I look forward to sharing more with you next month!